On a much lighter note, I came up with this quick and easy copycat recipe so that everyone can enjoy this delicious sandwich ANY TIME OF THE DAY! It's also half the fat because I use an all veggie pattie that tastes pretty darn good, slathered in between a buttered up piece of english muffin. I have to admit though, that I will ALWAYS be a sucker for the sausage patty that Mcdonald uses for their Mcmuffin! At least with this recipe, you have the option of going healthier. You can omit the butter(can't see why you would want to),use fat free sharp cheddar cheese, use ALL egg whites, and even use fat free english muffins as a substitute! Although, I will warn you..I tried the fat free english muffins before and they don't taste very good! Nonetheless, how awesome is it that you can enjoy a favorite sandwich of yours with only half the calories?!? TRY THIS RECIPE...YOU WON'T BE DISAPPOINTED!! Place your tin can into an ungreased and unheated non stick pot. Turn the stove up to medium-medium high heat. Put the lid on and allow the pot and can to heat up before adding in egg. Spray the bottom of the tin can with some cooking spray. Carefully, drop in your egg. Add a little bit of water to pot(just enough to coat the bottom of pan). Put lid back on, and allow to cook for 5 min or so. Check your pot at least once during cooking time and add more water if it has evaporated before your egg is fully cooked. When your egg looks cooked but you still have more water in your pot, remove the lid and turn up the heat to high for a quick second, to allow your water to evaporate. Remove and set aside. 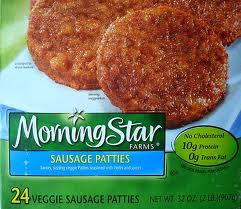 Follow the directions on the Morning Star package. You can choose which way you'd like to cook them. It should take a good 8-10 minutes. When your veggie patties are almost done, start buttering up your english muffins and place them buttered side down in a large skillet. Once they've browned, flip them over and place a slice of cheese on it and allow it to sit for about 10-15 seconds. Remove from heat. 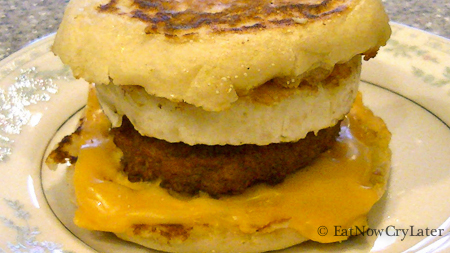 Well in the UK, we get our McMuffins until 10.30am, but that's still a stupid time - who wants to eat burgers at 10:31? Anyway, this weekend I made the family my own Sausage & Egg McMuffins with patties made from good quality sausage links (skins removed) - they were really popular! Anyway, thanks for this, we eat too much meat in this house and so I'm going to give the veggie versions a try! I found a gadget that can replace the tin can in cooking the egg. It's a circle of metal about the diameter of the can, but only high enough to hold the egg. There is a moveable handle so it can fit in the pan under the lid. Useful for other fried eggs, too. I have been doing this for awhile now, just minus the egg. I don't like eggs. Thanks for sharing! mcdvoice survey, you need to visit Mcdvoice.com. Follow this guide step by step to take part in the survey and receive a coupon code -www.McdVoice.com.